U finx ai iz hampsta?? 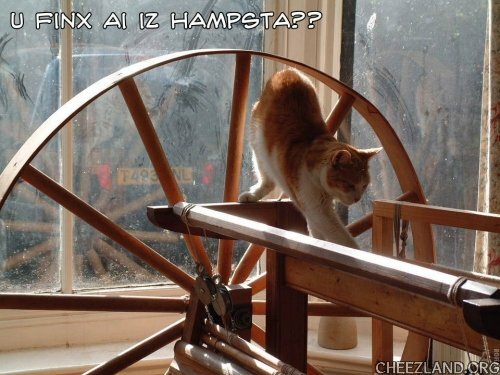 Cat_S sez: Scraps (the one with the spinning wheel) was the momcat of the other two. She was the sweetest cat imaginable – a little feral who turned up on the kitchen doorstep. Despite firm instruction my teenagers started feeding her with leftovers from the table – hence her name. By the time I resigned myself to adopting her she was pregnant and had four ginger girls, Mabel, Delilah, Carrot and Greebo. Scraps was the only cat I’ve ever known who really showed gratitude for things done for her – she seemed always to remember how hard her early life had been! No, but we noe kittehs aer clebber! Yep ai saw dat wun awn teh Beeb Beeb Ceeb websit Syense sekshun. Kittehs noe stuff tu! Ufnee fing is dat dere am kitteh weels fur indoor kittehs tu run awn. Syentists tellin us wat we awlreddee noed! An kittehs noe wen u haz a sad an need a kitteh 2 cuddlol. Nawt sew much dat az proobin wat we sez am troo. Well sort ov moar liek fyndin ebidense dat stronklee suggests wi am rite. “Scraps” ai luv teh naem an teh storrie.